Hundreds of organizations in every major vertical are looking to Cloud Access Security Brokers (CASBs) to protect corporate data in the cloud and enable secure BYOD. In all industries, from higher education to healthcare, the ability to identify risky behavior and control access to sensitive information across cloud and mobile is critical. 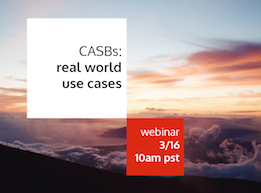 In this on-demand webcast, we discussed several successful CASB deployments that meet the needs of both end-users and IT administrators. Watch the webcast to learn more about how a comprehensive cloud security solution can help protect data across any device anywhere.